... and the lucky winner of the Parking Pal giveaway is.... commenter #11, dolls123! I'll be emailing you for shipping information. Congratulations and Happy Halloween! ... for everyone else, check back here soon for more giveaways. Next week, on election day, I'll be giving away an I-Dog! All of a sudden, The Pea has become quite the Cool Girl among her circle of friends, and I've become something of a Cool Mom. Have we pierced both our navels? Had dinner with Miley Cyrus? Nope.... the reason for our status is the news (which Pea told to her best friend, who spread the news to their other friends) that I've received two brand spanking-new I-Dogs (the I-Dog Clip and I-Dog Dance) from Hasbro. I had no idea these little doggies -slash- speakers were so popular (which shows how Un-Cool I actually am). The I-Dog Clip, the latest of the line, is shaped just like the regular I-Dog's head, complete with the poseable ears and face that lights up when you plug it into your portable music player and play music. Behind the head is a clip that allows you to attach the I-Dog Clip to your belt, backpack, bag or clothes. It's a fun little fashion accessory that allows kids to share music with their friends wherever they go. My kids are fighting tooth and nail to claim ownership of the I-Dog Clip, but I'm keeping it for myself. This little dog will be coming along with us the next we travel. The next time we're stuck at an airport security line, I'm whipping out the iPod and I-Dog so all 3 kids can listen to a story or song at the same time. How practical is that? (See, told you I was Un-Cool). 1) at checkout, on the Billing Infomation page, go to the section labeled “Promotion Code” (above the credit card payment box) and manually enter the Promotion Code and PIN. 2) Call 1-800-800-5800 and give your "Promotion Code" and PIN to the customer service representative. Here's something scary: the free shipping offer only lasts for 4 more days, till October 29! My sister's two eldest kids are two years apart. I admiring the technique she used to keep her rambunctious 2-year-old son safe while she struggled to unfold the baby stroller in parking lots. She would say, "Keep your hands on the car, kid, hands on the car". And it worked. He put his hands on the car and stayed still. The Parking Pal magnet builds upon her tried-and-true method. It's a strong, flexible magnet that parents or grandparents or babysitters place on the side of the car. It gives kids a specific spot to "high-five" -- and stay focused on -- while the grownup in charge struggles with groceries, keys, or any of the millions of distractions that can take our attention away from small children when loading or unloading a car. Now you can try the Parking Pal for free! I'm giving away 1 Parking Pal magnet on Halloween, Oct. 31. To enter, just leave a comment on this post with your email address so I can contact you. I'll draw a winner at random on October 31. For full contest rules, click here. The folks at Parking Pal are giving away a $100 Toys-R-Us gift card to one lucky entrant. To join the contest, just purchase a Parking Pal magnet from their online store, or for a free entry, send your name and address to by 12/14/08 to: Parking Pal, 317 Nickless, Frankenmuth Mi 48734. Entries must be postmarked by 12/14/08. * Use an hourglass timer. We had one but keep losing it because the kids take it out of the bathroom to play with it. * Use an egg timer or a watch. Booooring. * Use an electric toothbrush with a timer in it, like Philip's Sonicare. Booooring. * Count to 120 or sing Happy Birthday 10 times. Tedious -- which means I always rush through it, making it inaccurate as well. Enter ToothTunes, the musical toothbrush that plays fun kids' tunes for the recommended 2 minutes. What a great idea! 3Po and Jammy, my two Tooth Tunes testers (how's that for a tongue twister), really look forward to brushing their teeth and listening to the music the whole time. I don't have to time them or nag them to keep brushing, keep brushing . And I like that they make different ToothTunes brushes with different tunes so kids can choose the ones they like best. They even have ToothTunes Junior for preschoolers and Turbo ToothTunes for older kids. The only problem is that much as the kids enjoy it, you're essentially getting just another timer for $9.99 -- and a disposable one at that. I do wish Tooth Tunes had made their toothbrush electric -- imagine a Philips Sonicare that plays music and spins its bristles and stops everything after 2 minutes. The combination of timed music and timed electric brush head would be unbeatable! 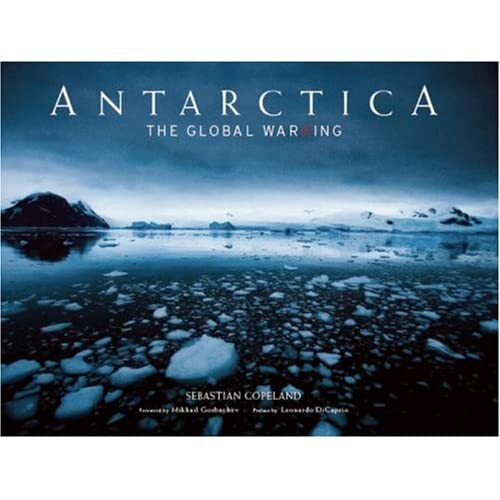 I won Antarctica: The Global Warning at a raffle. I was actually the runner-up for the grand prize: 2 tickets to a charity dinner featuring Matt Damon, Josh Groban and other celebs. I know, first runner-up is very important, if for any reason the winner cannot make it.... blahblahblah. So you can understand my initial disappointment. This book actually makes a very nice consolation prize. The photographs are stunning. I remember thinking as I leafed through, I wish he hadn't played around with Photoshop so much. A bright blue iceberg amidst a black sea and an orange sky? Come on! The colors look so fake! Later on I read that he hadn't done any color editing at all, that Antarctica's color spectrum really is that rich in saturation. Wow! I do agree with one reviewer on Amazon, there are so many images of iceberg upon iceberg, with no captions or context, that one tends to skim over the last half of the book. But unlike him, I found the text fascinating and I totally agree that humans are affecting global warming in a huge way. But whatever you think about the "Global Warning" part, you have to be impressed with the "Antarctica" part. I went to Silicon Valley Moms blog to check up on my latest post, and lo and behold, I saw this little contest just below it. Who doesn't want to win a $10,000 fashion makeover, especially when no purchase is necessary -- and you don't have to sign up for their e-newsletter or special offer emails or whatever? * Mummy's Product Reviews is giving away a Once Upon a Potty book. Hurry on over and join! I'm a big fan of the simple, uncluttered lifestyle espoused by Real Simple magazine, so I was happy to get a sneak peek at TLC's new show, Real Simple, Real Life (the first episode airs tonight). For some reason I was expecting a beautifully photographed, visual magazine show like The Martha Stewart Show. Surprise one: the two couldn't be more different. The Martha Stewart Show is almost like fantasy (this is what a perfect ganache looks like! see the fantastically carved pumpkin!) while Real Simple, Real Life is hard reality. Host Kit Hoover and a team of experts (beauty, fashion, organization, finance, fitness, design, motivation, food) go into busy women's homes and give their chaotic lives a makeover. Surprise two: The woman in the first episode is ME. Seriously! Okay, her name is Emily and she lives in Pasadena, but otherwise she's me. She's an MBA turned SAHM, former product manager, has an older girl and twin boys 2.5 years apart, a pack rat, loves to shop for bargains, blogs. See? SHE. IS. ME. So it's no surprise that I loved this first episode. I can totally relate to the feeling of overwhelming helplessness in that horrible (yes, horrible!) first year of the twins' life. Man, I reeelly could have used that Real Simple team of experts four years ago. They cleaned out her garage, organized her home office, streamlined her closet and gave her a makeover. The experts do a great job -- the "Before" and "After" shots were quite dramatic -- and also share useful tips with viewers (I like the idea of keeping only current items in your closet and packing away out-of-season items). Go watch this show! One day at school I ran into the mother of one of The Pea's classmates. 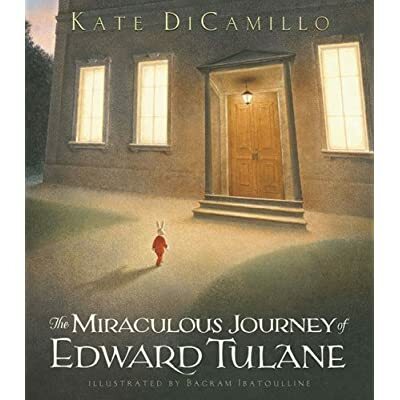 She was carrying a children's book -- The Miraculous Journey of Edward Tulane -- and pressed it into my hands. "Has The Pea read this? No? Here, I'm lending it to you, you simply must read this, it's a wonderful book!" There is truly nothing like the recommendation of another parent, so I took the book and handed it to The Pea. I had intended to read it with her at bedtime, as her friend's mom suggested, but yesterday she read it all by herself. When she was done, she came to me with her face all red and blotchy. "What's wrong, honey? Didn't you like it?" The story, and the tears, came pouring out. "I liked the story but there was this girl and she had a toy bunny called Edward Tulane and she lost it and a fisherman found it but it got thrown away in the garbage and this old woman found it and..." -- lots of sobs here -- ".. she NAILED the bunny to a fence!! And then a boy rescued it and gave it to his sister, " -- even more sobs -- "but she dieeeeeed..."
Yikes! I had guessed the story might be a bit sad at times, rather like The Velveteen Rabbit, but this sounded like the Grapes of Wrath! I resolved to read it myself. When I finished the book, I was in tears as well. Don't worry, it's a happy ending. The Pea neglected to tell me that the little bunny started out as a cold, unfeeling toy, and the real journey was in his heart. About how he meets people who love him unconditionally, and how he learns how to love them back. The Pea and I both love this book. We're just big, soft crybabies with big hearts. Just like Edward Tulane. Gymboree is having a fall sale, with items up to 60% off! Just in time, too -- the weather is turning really cold, really quickly. They have the cutest Halloween shirts right now, and I've been waiting for their boys' puffy vests to go on sale. With the in-store tv playing all sorts of kids' programs, I can even take the boys shopping. Check out the ice cream confections that my kids made with the new Play-Doh Magic Swirl Ice Cream Shoppe. Aren't they cute? Don't they make you wish they were made of real ice cream instead of salty Play-Doh? (Oh, come on, you know what it tastes like, I know you've tried it at least once in your life). 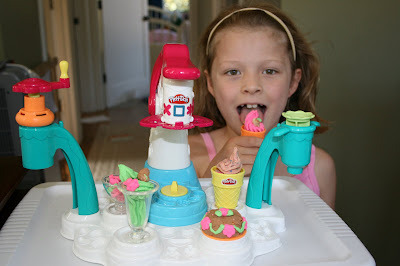 My kids were overjoyed when we received the new PlayDoh Magic Swirl Ice Cream Shoppe playset to try out. They already have the old version of this toy, and have spent many happy hours squishing out sundaes and soft-serve cones. The new one improves on the old one in so many ways. It's bigger and badder, with a rotating extruder (the "Magic Swirl"), topping maker, and more molds (to make Oreos, gummi bears and pretzels). Best of all, it comes with a can of the coolest Play-Doh ever -- sprinkle Play-Doh. White dough with colored sprinkles in it! What will they think of next! All this awesomeness comes at a price; the playset is more difficult to clean, bulkier, and doesn't come apart so it's difficult to store (Alfie disagrees with me on this one -- he loves the sturdiness). But hey, that's just my love-hate relationship with Play-Doh talking: I hate cleaning up Play-Doh messes, but can't bring myself to ban it because the kids love it so much and I know it's great for developing imagination and fine motor skills. Alfie and I have already accepted countless dishes of new and improved Play-Doh ice cream to marvel at and taste. Good thing it's Play-Doh, or I would seriously be in need of a diet. The Pea's second-grade class is currently doing a unit on nutrition. They are learning about the different foodgroups and the importance of a varied diet. I thought this would be the perfect time to introduce the SnackerTracker, a nutritional tracking system for kids and their parents. 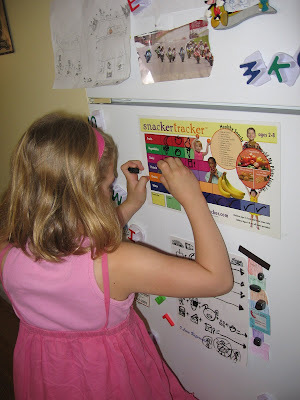 The SnackerTracker is like a food journal for kids -- only it's a whiteboard fridge magnet that breaks down a child's daily nutritional requirements into blocks. Every time your child eats a serving of some basic foodgroup -- grains, dairy, protein, fruits, vegetables, water -- you simply cross out one of the blocks. The kit also comes with a dry-erase pen and a nutritional guide with tips on serving sizes, snack suggestions and exercise guidelines. So far the kids have responded with enthusiasm. The Pea and Jammy are constantly fighting over who gets to fill in the blocks (actually they've gone a step further and actually draw what they've eaten instead of just checking the box off). Throughout the day they think about what they need to eat to fill up all the boxes on the chart. Do we always get there? Hell, no. But at least the SnackerTracker making me more aware of our nutritional shortcomings. We were at Borders today when I happened to glance down and see this book on a shelf. When 3Po saw the cover, he immediately said, "Goodnight Moon!". That's just what the authors intended; Goodnight Bush is a clever take on Margaret Wise Brown's classic goodnight tale. The text is hilarious ("Goodnight nation great; And goodnight church and state") and the illustrations are just as funny (just look at the oilfields in the painting over the fireplace, and the ballotbox burning in the fire). It would be really funny if it weren't so sad. I don't know whether these are one-time use coupon codes or not, so it's first come first served.